I've had an ongoing love affair with Costco since it arrived in Indy several years ago- back before I had children. I could make jokes about the giant tubs of mayo or huge tubes of toothpaste (I have been oft impressed by the giant bottle of A1). But instead, I want to share a couple of things I love about Costco. 1. Diapers. I buy the Kirkland Signature (Costco store brand) and 1 case basically lasts a solid month. I guess I should be able to spit a bunch of numbers at you- how much a case costs, how many diapers are in a case, price comparisons to other brands and stores. But I don't have all of that in front of me. What I can tell you is that there is great comfort in only buying diapers once a month. Ballpark cost is $40 a month. The diapers are quality. I'd compare them to Huggies Supreme. We don't have leakage issues. I'm going to go ahead and put the wipes plug here, too. I love their wipes. 1 case lasts... months. And we use those wipes on butts, hands, faces, feet, spills, carpet, tables... not all at once, of course. Today was a Costco shopping trip day. I found a deal that almost made me cry. Tears of joy. 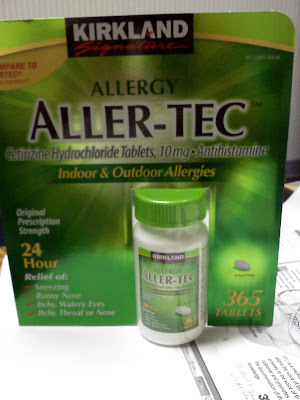 Yesterday, I had an allergy attack. I had no drugs on me. I like Zyrtec (cetirizine hydrochloride). I went to CVS to pick up a box. 14 count of CVS brand was $6.49. $0.46 per pill. Today I found this at Costco: 365 pills. A year's worth of drugs- more, actually, since I don't take it daily. 365 pills. In a bottle. Wanna know how much 365 pills cost? At the CVS price, the cost of the bottle would have been $169.20. The Costco price? Still not sold on how great Costco is? 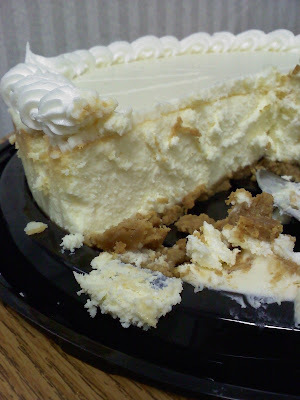 That's a Costco cheesecake. It's 16 slices. It's 2" tall. It's creamy, yummy. It cost $12.99. Explore the joys of Costco. Go around lunchtime so you can enjoy the samples (we had incredible roast beef, cheese, chicken sausage, potstickers, salmon, olives, and brown rice chips). Buy gas at a price that is usually cheaper than the corner gas station (a tip- I was once told by a gas employee that the price is set each weekday morning and then stays put until the next weekday morning- so when the other gas stations are raising prices all day long, Costco stays steady). Eat a giant slice of pizza and have a fruit slushie at the food court (or one of the only hot dogs I will ever actually eat). And please get yourself some cheesecake today. Celebrate! It's a National holiday! Amen. Here's something else great about Costco: they treat their employees like human beings! Instead of hiring 3 part time workers to do the work of 1 person in order to avoid paying healthcare costs (like Wal-Mart) they provide above market pay and full benefits for everyone. They regularly rank highly in polls about best places to work. On a personal level, they were the only major retailer who agreed to carry my book (A Parent's Guide To Seattle) until it started to sell, then others jumped on board. They're also a Seattle-based company, which makes me happy. I remember shopping at the original Costco in the early 80's. Back then it was junkier and funkier, but still full of amazing deals. Tom! I didn't know you'd written a book! Cool! Tom & Flartus- A big part of why I love Costco is because they aren't Wal Mart (Sam's Club- same diff). The quality is better, the corporation is better, the company is better. Fartus, I know you are one who is passionate about workers rights and such... definitely do some research into Costco and then into WalMart (Sam's) and see the difference! Kiki- I feel the same way. I have a lot of choices I make that probably look pretty crunchy but I don't think anyone who met me on the street would feel that way! We're big Costco fans here too. Their Filet Mignon is excellent, and the best price anywhere. They have decent hamburger too. We usually partition the burger and steaks up when we get them home, wrap them up good, date them and stuff them in the freezer for later use. When it comes to things like meat, paper products, diapers, cooking mixes and the like, Costco can't be beat. And - they have that huge chocolate cake. Makes my heart skip a beat just thinking about it. We've been debatinG the merits of Costco since it's just the two of us, and I wasn't sure if it was worth it but man, I think you have me sold! And that cheesecake is SO yum! You can always go and visit Costco with a guest pass kind of thing. Or find someone with a membership (like me) and get in that way! I LOVE Costco BUT they weren't as nationwide as Sam's so for our travels, we used Sam's. Have you ever tried Costco's sheet cakes? Filled w/chocolate (or whatever you choose) cream. 1/2 sheet cake for $15! Milk is always cheaper at Costco and the pharmacy prices are hard to beat. Kids jammies and playclothes, books, and Christmas photo cards are also among my routine Costco purchases. I know, I know, I know. Costco is wonderful. But I have found that I spend way less money if I DON'T go there. I just find things way too irresistible. I feel the same way as you about Costco. Some of the deals are so great you just can't believe it. I've got a whole blog about my love for Costco - AddictedToCostco.com. They have great prices not just on over the counter drugs but also on prescriptions. If you haven't tried the pharmacy you really should. Holy COW! I would love to have a Costco to by that Zrtec knock-off. Maybe they have it at Sam's Club?